Ford estimated Thursday its certified collision repair network spanned about 1,200 new applicants and grandfathered repairers in some form. 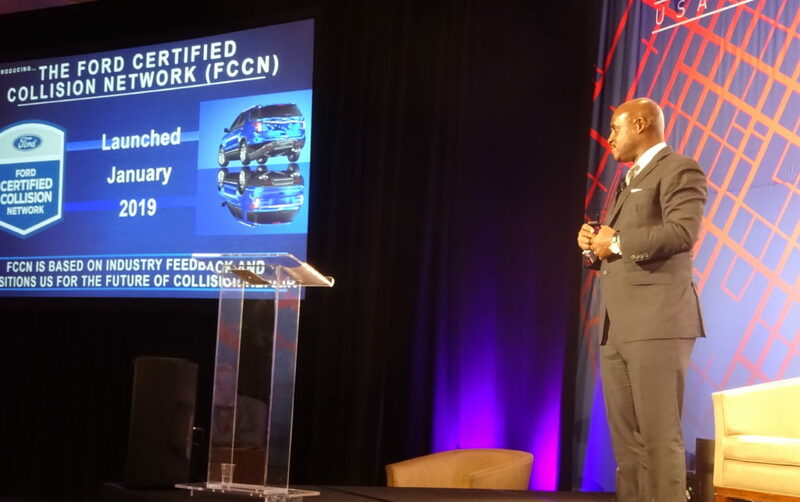 Roughly 850-900 shops were official and present on the Ford certified auto body network locator, Ford global collision marketing Rob Johnston told a VeriFacts Guild 21 call. However, it was “literally changing by the hour,” he said. Ford automatically grandfathered any shop on the old Assured Performance-managed certification program to the new network run in-house by the OEM since January 2019. Those repairers won’t have to meet the new network’s similar criteria until their renewal date. Johnston said shops who were in the old network should log on to ARMS Business Solutions — which he estimated many shops possessed and which Ford is using for the network — and fill out their profile to appear on the official Ford locator. Johnston said Ford already had a great program in Assured Performance but wanted to bring it in-house. The Ford program still needed repairers, according to Johnston. “I don’t have enough shops,” Johnston said. He said he didn’t know if the automaker would ever reach a point of overcapacity that would lead to a cap on certified shops, though he described Ford as having estimated how many facilities it needed. “We need capacity,” he said. A primarily heavy-duty truck body shop asked about the scope of the program, mentioning the F-250 through F-750 and noting that issues arise with vehicles of more than 10,000 pounds, such as not fitting in a paint booth. Johnston noted some of the certification facility and equipment requirements might become “dicey” with really large vehicles and said the program was aimed at a specific volume. However, for a shop doing a great deal of “F-250-type stuff, I think our program might benefit you,” he said. The program costs $2,250 for independent shops, Johnston said, which he called “very reasonable” and “much less” than under Assured Performance. Such a cost comparison might not be this clear-cut for Ford shops who had held other Assured Performance certifications, given the certifier’s structure. Assured Performance allows shops for a base $2,950 fee to easily join each of its partner OEMs’ programs at add-on rates. Joining the Ford network in 2018 prior to the transition cost only an additional $500, for example. Autobody News reported in 2018 prior to Ford’s departure that a repairer could be certified for all five of its OEMs for $6,300. CEO Scott Biggs on Monday said Assured Performance had also offered a Ford-only rate of $1,950. But there are new perks. Johnston said Ford’s official repair procedure site Motorcraft is included with the enrollment fee. A year of the repair procedures would normally cost $2,699.95. and wasn’t included before. Ford will also provide a technical collision hotline in which certified shops could use I-CAR to contact Ford engineers with questions. Ford also will provide feedback on live repairs during its inspection of the facility to verify the necessary infrastructure and training. 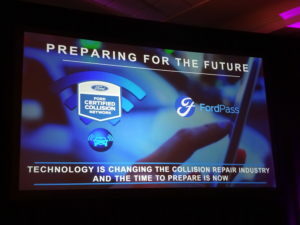 The OEM will also refer customers to certified shops through its Ford Pass app — not “buried in a website somewhere” and ultimately through connected vehicles themselves after a loss, according to Johnston. The app had more than 1 million downloads as of Friday on the Google Play store. Ford’s research found that 52 percent of customers felt choosing a body shop certified by a manufacturer was more important than one conveniently located (7 percent), recommended by the insurance company (20 percent) and recommended by a friend or family member (21 percent). Johnston said the in-house program has received positive feedback from shops, grandfathered and enrolling ones as well as those merely enquiring about the program. He said it had “great feedback” from MSOs and other industry stakeholders. The next Guild 21 call is planned for May 9 at 2 p.m.